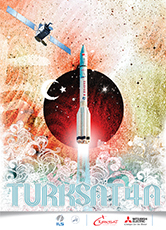 TURKSAT-4B is a commercial communication satellite built by Mitsubishi Electric. The satellite will provide telecommunication and direct TV broadcasting services over a wide geographic region between west of China and east of England spanning Turkey, as well as Europe, Central Asia, the Middle East and Africa. TURKSAT-4B will be positioned at 50 degrees east longitude and consists of multiple transponders with an expected on-orbit maneuver life of 30 years. TURKSAT-4B satellite will expand the space capacity of Turkey and provide enhanced performance to its coverage areas. The satellite will provide high flexibility of switchability and connectivity among different service areas to its customers. The Proton M launch vehicle, utilizing a 5-burn Breeze M mission design, will lift off from Pad 39 at Baikonur Cosmodrome, Kazakhstan, with the TURKSAT-4B satellite on board. The first three stages of the Proton will use a standard ascent profile to place the orbital unit (Breeze M upper stage and the TURKSAT-4B satellite) into a sub-orbital trajectory. From this point in the mission, the Breeze M will perform planned mission maneuvers to advance the orbital unit first to a circular parking orbit, then to an intermediate orbit, followed by a transfer orbit, and finally to a geostationary transfer orbit. Separation of the TURKSAT-4B satellite is scheduled to occur approximately 9 hours, 13 minutes after liftoff. The launch of Russia’s Proton-M rocket with the Turkish satellite Turksat 4B is scheduled for 20:40 GMT from the Baikonur cosmodrome, the Khrunichev State Research and Production Space Centre - the producer of the rocket and Briz-M upper stage, told TASS on Friday. According to the flight sequence, the first stage will be separated from the rocket 120 seconds after the blast-off and on the 327th second, payload fairing (PLF) covering the satellite during the flight through dense atmosphere will be jettisoned. On the 582nd second of the flight, the payload will reach the suborbital trajectory and will be placed on the target orbit by the Briz-M booster. The ascent mission duration will be 9 hours and 13 minutes. The Turksat 4B satellite will be used to provide telecommunications services and has no military purpose. Turksat-4B was built by Mitsubishi Electric. The satellite will provide telecommunication and direct TV broadcasting services over a wide geographic region between west of China and east of England spanning Turkey, as well as Europe, Central Asia, the Middle East and Africa. Turksat-4B will be positioned at 50 degrees east longitude and consists of multiple transponders with an expected on-orbit manoeuvre life of 30 years. Turksat-4B satellite will expand the space capacity of Turkey and provide enhanced performance to its coverage areas. It will be this year’s sixth launch of the Proton rocket and the 407th in its flight history. The previous launch of the Proton rocket was carried out on September 14 this year with the Russian communications satellite Express AM8. The next launch of the Proton-M rocket is preliminarily scheduled for December 20. This launch that will be carried out in the interests of the Russian Satellite Communications Company (RSCC) is to orbit the Express telecommunications satellite. An initial burn by the Breeze M’s main engine stabilized the spacecraft in a low-altitude parking orbit, and four more firings raised Turksat 4B’s altitude and move its orbit closer to the equator. After the Breeze M’s fifth burn, the upper stage was scheduled to release Turksat 4B at 0553 GMT (1:53 a.m. EDT) Saturday. The mission’s target orbit numbers were published by International Launch Services, the Proton’s U.S.-based marketing and sales firm. ILS confirmed the successful deployment of Turksat 4B early Saturday.